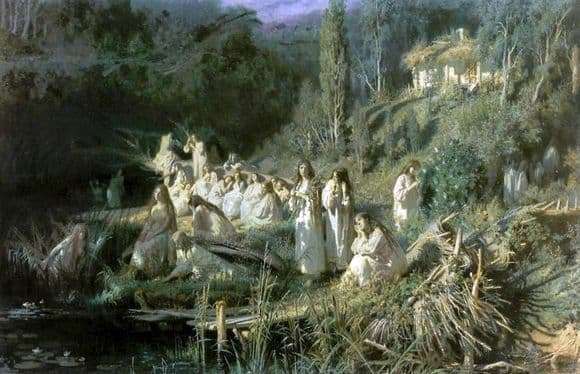 The painting “Mermaids” was written by Russian artist Ivan Nikolaevich Kramsky based on the “May Night” by N. V. Gogol. The artist quite freely interpreted the dream of the main character Levko, focusing not on his plot, but on the image of a magical moonlit night in Ukraine. Before the viewer appears overgrown and littered with logs bank of the river, on which the picturesque group of drowned peacefully sits. Their thin figures are illuminated by the full moon and this makes them even more shaky and unreal. The faces of the girls are sad and sad, all of them were overcome by hopeless longing. In the background at the top right is the old manor, and to the left is the impenetrable dark and dense forest. The coloring of the picture is relaxed and calm, some gloom of colors softens the magnificently written moonlight, which generously illuminates the scene. Kramsky enchanted the world of Ukrainian folk tales with devils, witches and mermaids, because he chose this story. Kramskoy was interested in the unreliable correspondence of the picture he painted to the work of Gogol, he wanted to convey the beauty of the fabulous Ukrainian night, as well as his sympathy to the unfortunate mermaid girls, simple peasant women, who so tragically ended their earthly existence. In this picture, Kramskoy decided to make the task rather difficult for a painter to depict moonlight so that in the picture he looked like a real one. The artist worked on this picture for a long time, trying to correctly, in his words, “catch the moon”. And although he himself was not completely satisfied with the final version of the picture, critics noted that Kramsky was able to convey the fantastical and fabulous nature of the plot, and still catch a bit of moonlight in his work. Kramskoy was interested in the unreliable correspondence of the picture he painted to the work of Gogol, he wanted to convey the beauty of the fabulous Ukrainian night, as well as his sympathy to the unfortunate mermaid girls, simple peasant women, who so tragically ended their earthly existence. In this picture, Kramskoy decided to make the task rather difficult for a painter to depict moonlight so that in the picture he looked like a real one. The artist worked on this picture for a long time, trying to correctly, in his words, “catch the moon”. And although he himself was not completely satisfied with the final version of the picture, critics noted that Kramsky was able to convey the fantastical and fabulous nature of the plot, and still catch a bit of moonlight in his work. Kramskoy was interested in the unreliable correspondence of the picture he painted to the work of Gogol, he wanted to convey the beauty of the fabulous Ukrainian night, as well as his sympathy to the unfortunate mermaid girls, simple peasant women, who so tragically ended their earthly existence. In this picture, Kramskoy decided to make the task rather difficult for a painter to depict moonlight so that in the picture he looked like a real one. The artist worked on this picture for a long time, trying to correctly, in his words, “catch the moon”. And although he himself was not completely satisfied with the final version of the picture, critics noted that Kramsky was able to convey the fantastical and fabulous nature of the plot, and still catch a bit of moonlight in his work. he wanted to convey the beauty of the fabulous Ukrainian night, as well as his sympathy to the unfortunate mermaid girls, simple peasant women, who so tragically ended their earthly existence. In this picture, Kramskoy decided to make the task rather difficult for a painter to depict moonlight so that in the picture he looked like a real one. The artist worked on this picture for a long time, trying to correctly, in his words, “catch the moon”. And although he himself was not completely satisfied with the final version of the picture, critics noted that Kramsky was able to convey the fantastical and fabulous nature of the plot, and still catch a bit of moonlight in his work. In this picture, Kramskoy decided to make the task rather difficult for a painter to depict moonlight so that in the picture he looked like a real one. The artist worked on this picture for a long time, trying to correctly, in his words, “catch the moon”. And although he himself was not completely satisfied with the final version of the picture, critics noted that Kramsky was able to convey the fantastical and fabulous nature of the plot, and still catch a bit of moonlight in his work. In this picture, Kramskoy decided to make the task rather difficult for a painter to depict moonlight so that in the picture he looked like a real one. The artist worked on this picture for a long time, trying to correctly, in his words, “catch the moon”. And although he himself was not completely satisfied with the final version of the picture, critics noted that Kramsky was able to convey the fantastical and fabulous nature of the plot, and still catch a bit of moonlight in his work.